Home » Traditional Evenk Hunting Dress. 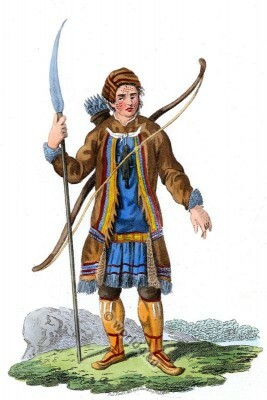 A Tungusian in his Hunting Dress. Un Toungouse en Habit de Chasse. THE Evenks are indebted for their name to their Tartar neighbours, by whom it was first given them in derision. It signifies, in their language, ” eaters of hog’s flesh.” The Evenk call themselves Donke, but more commonly Boïe ” men.” They form the most numerous people of Siberia; over which country they are scattered, from the fifty-third to the sixty-fifth degree of latitude. They are subdivided into tribes, in the manner of the Orientals. As they are of a quiet and peaceable disposition, the inhabitants of various other nations have settled among them. They are of the middling stature, well made, and of a lively complexion. Their hair is black and straight; their beard is light, and it is not uncommon to see a Evenki with no beard at all. Content with the necessaries of life, they are not anxious of obtaining its superfluities. Their present manners are those of their ancestors; their former customs are the only ones still known amongst them, and the communication they have had with foreign countries has not induced them to adopt any of their luxuries. The Evenks speak the same language as the Manjours. It is said to be soft and agreeable. The Evenks subject to Russia are ignorant of the art of writing. They separate the year into two parts, which, according to their mode of dividing time, form two whole years; the winter year, and the summer year. Thus the man who is thirty years of age, says that he is sixty. These years, or, more properly speaking, these half-years, are sub-divided into fifteen months. Wandering over extensive deserts, or profound forests, part of them live on the produce of their chace and their fisheries, while the troops which are reared by the other part, supply them with the means of subsistence. The same Evenks who hunt in the winter, become fishermen during the summer; but whether fishermen or hunters, they seldom remain more than three or four days in one spot. They are the most wandering of all the nations of the Russian empire; both hunters and pastors are free, in proportion to their poverty. A small number of hunting and fishing utensils, with which they. are badly supplied, the clothes on their back, a few dogs, and a tent, are the whole riches they possess. The Evenks who has acquired some small property by hunting or fishing, generally purchases a few rein-deer, and turns pastor. These pastors possess from twenty to a thousand of these animals, and some of them a still greater number. The Evenks wandering in more southerly solitudes, on the banks of the Argun, the Onon, and the Bargouzina, possess horses, cattle, sheep, and camels. They are skilful huntsmen, sit well on horseback, and combat with much courage.